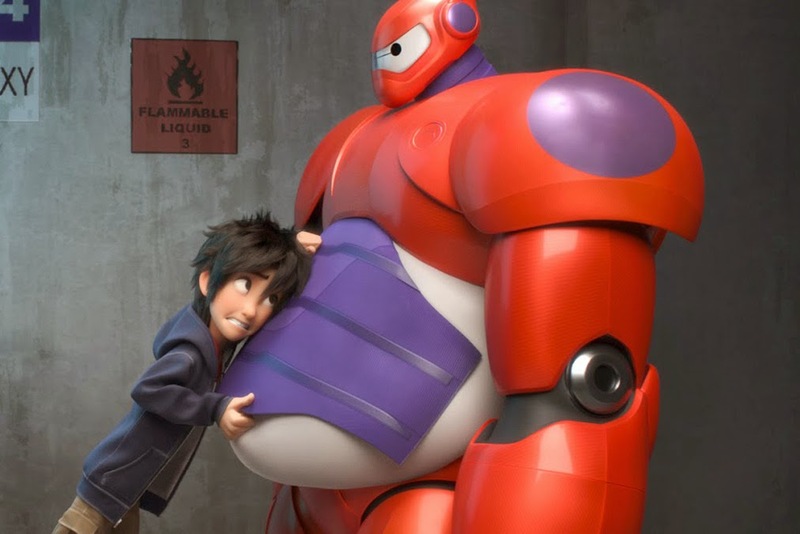 Big Hero 6 is good until it stops being good. The first half to two acts of Big Hero 6 are actually quite enjoyable. It’s cute, funny (a recurring joke about fist bumping is wonderful) and energetic with some truly impressive animation. And then…the action ensues. Few things are as uninteresting to me as action sequences in animated movies. They have no weight, no stakes and devolve into action nonsense. The last half hour of Big Hero 6 is all noise. I did not enjoy this stretch of the movie at all. But the movie is still worth seeing. 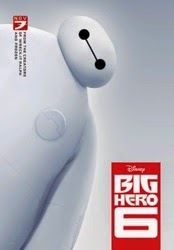 I think I’m disappointed with Big Hero 6 due to intention. The movie starts as a touching story of two brothers and the robot one of them has created. Then, through a bizarre turn of events, the movie becomes a low-rent The Incredibles. I much preferred the former trajectory. I shouldn’t be surprised, though, that Big Hero 6 turns into a superhero movie (about a team of 6 science students turned supers) since the story is based on a comic from Marvel. I did not know this going in. I thought I was just seeing a traditional Disney animated movie. Oh well. The Stan Lee cameo (post-credits) is cute. 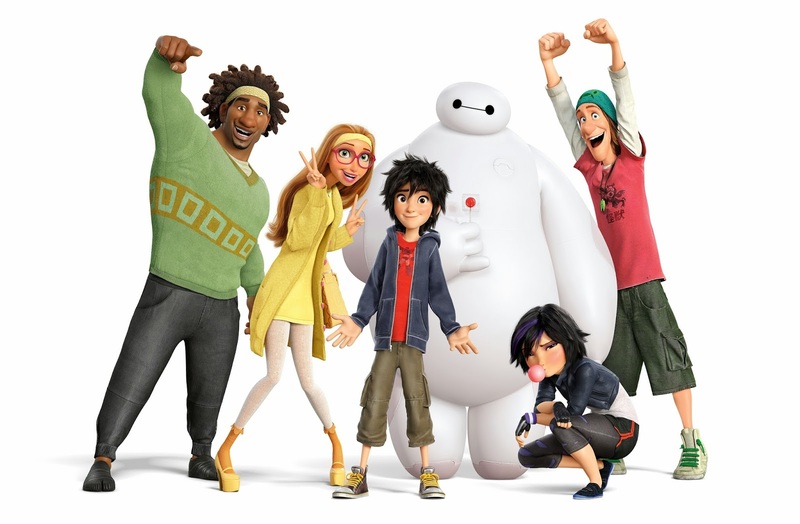 The plot in brief: Robotics genius Hiro Hamada and his friends Go Go, Tamago, Wasabi, Honey Lemon and Fred team up with Hiro’s brother Tadashi’s robot, named Baymax, to create a group of high-tech superheroes determined to solve the mystery of a dangerous villain on the streets of San Fransokyo. Big Hero 6 won’t win any points for originality. It’s derivative of not only The Incredibles, but also other Marvel properties like The Fantastic Four as well as How to Train Your Dragon, The Iron Giant and Sky High. The movie rarely feels like its own thing. While entertaining, it’s hard to overlook that the movie feels a bit lazy and hollow. I was bored and restless once the super team assembled. Where the movie does succeed, though, is it has a great deal of heart. The pre-superhero setup to the movie is quite sweet. I love the dynamic between Hiro and his brother Tadashi, who are supportive and encouraging of one another. It’s rare to see a movie that embraces kindness between brothers to the extent of the early going of Big Hero 6. The filmmakers at least did a great job of setting up the emotional arc to the story, which unfortunately gets lost track of in the overblown action sequences of the climax. Another feather in the cap is the character Baymax, who, along with Ralph from Wreck-It Ralph and Stitch from Lilo & Stitch, goes into the annals of great 21st century Disney characters. Looking like a Stay-Puft Michelin Man, Baymax is amusing and lovable. The scenes with Baymax (pre-super suit) are some of my favorite material in the movie. Unfortunately, when the filmmakers add Baymax to the Big Hero 6 team, they suit him up similar to Iron Man and the mystique and appeal of the character is largely lost. But at least now he can do karate. I also want to commend the filmmakers for the interesting messages they are stating with Big Hero 6. Like this week’s Interstellar, Big Hero 6 is also very pro-technology. This is a movie that admires and champions innovation and technological progression, but has a strong message around the responsibility of the tech’s creators to use their talents to the betterment of society. This is also the second Marvel movie in a row (after Guardians of the Galaxy) that embraces the happiness that can be brought by friendship from a communal unit. That part of the movie is touching and why I believe most people will come back to Big Hero 6 for after their initial viewing. I wanted to enjoy Big Hero 6 much more than I did. As it stands, the movie is a fine, energetic diversion but not much more. It’s been said before on F This Movie! how important it is to stick the landing at the end of a movie, because if you don’t you’re left with a bitter taste in your mouth as you walk out of the theater. This is how I felt regarding Big Hero 6. If only they just stuck to the story of Hiro, Tadashi and Baymax and didn’t include the lame villain and super friends. Then you’d have something special. 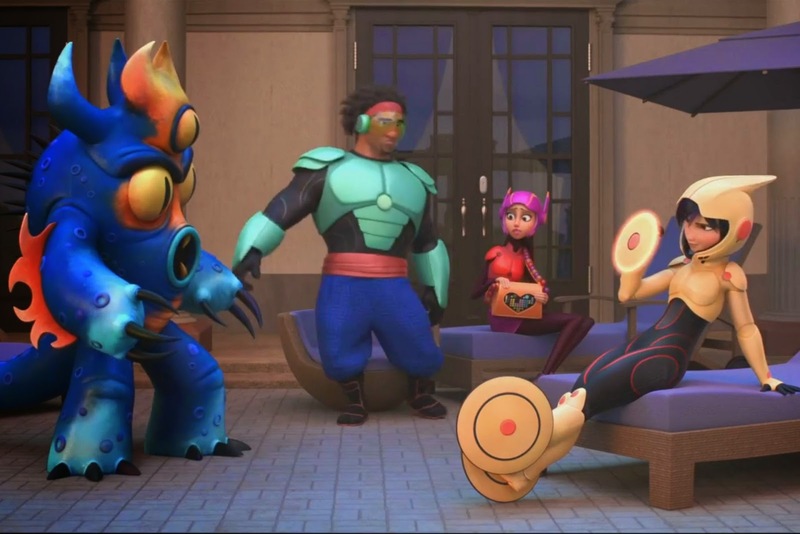 Note: There is a short before Big Hero 6 called "Feast," which is sweet, funny and altogether just about perfect. Here’s a brief clip. Big Hero 6 is worth seeing just to see "Feast" alone. I think I enjoyed the whole movie considerably more than you. However, I will agree that the moments with Hiro and Baymax or Hiro and Tadashi are the best parts of the movie. The dramatic moments of the movie were powerful and well done, too, I thought. Perhaps you would have liked the movie as a whole more if you had known what you were going in to? At any rate, that fist bump joke is by far the best part if the movie, and the thing I've carried around in my head the most since I've seen it. That was super funny and cute. I hated that they killed off Tadashi especially since there was already two dead parents. It felt like overkill to me (no pun intended). I'm not sure I would have liked the movie more knowing that it was going to be a superhero movie. It probably would have made me want to see the movie less. Am I crazy? Do animated action sequences work for you? They always make me check out. I can't say that I've ever had a conscious problem with them. I think they are fine, but I still agree that there are other better things in the movie than the action sequences. What did you think of "Feast"? Feast I loved. It's very charming and fun and well-animated. Although I was slightly distracted from it because there was a noisy kid almost directly behind me who kept stealing my attention at that point (thankfully he kept quiet for the actual movie). I can't wait to watch the entirety of that short again. After a bit of a sloppy start, Big Hero 6 quickly becomes an energetic, hilarious, and occasionally heartwarming shot of animated adrenaline. Fantastic animation, sharp humor , and great voice acting by all involved makes this a not perfect, but definite fun ride at the movies. It's at its most poignant and engaging when it comes to family matters, but loses points on the superheroics front.